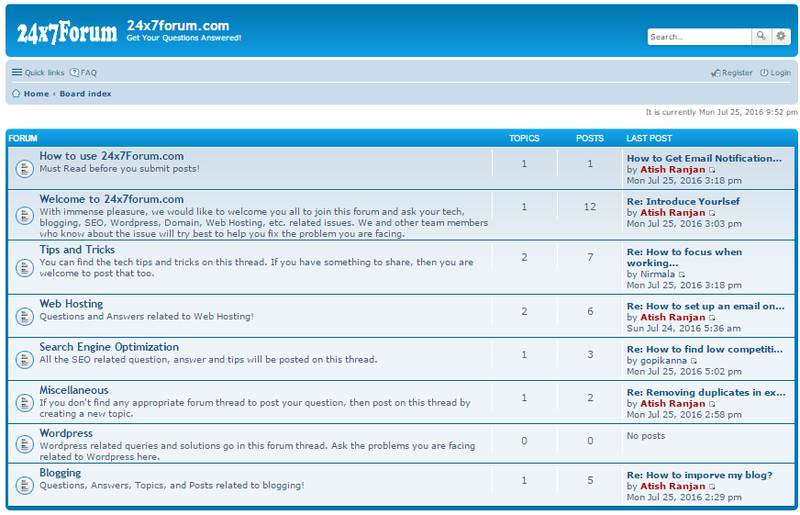 Hello Friends, today I would like to announce that I have created a forum at 24x7forum.com to help everyone. Now, let me explain why I have created this when I don’t get much time to blog even. If you already read my story, you might know that my online journey got started in a forum but later that forum was taken down by the administrator who is my friend. And, I met my blogging partner Zainil Dedhia in the same forum as well. Later we started blogging together, and now we have many blogs on our list, and we are quite happy with them. Blogging is my passion and now profession as well. But, working on the forum in initial days is something I cannot forget as everything started from there. So, I always wanted to have a forum but due to time constraint, never dared to start one. Recently, I had left spending time on Facebook as when I logged in; I used to keep on scrolling the news feed for hours, and my time was being wasted. I even cleared my entire friend list on FB so that I can keep away from it, and asked everyone to connect me on emails. And, I am happy that I got success in leaving the FB. Now, I open it just for 10-15 Mins every day for updating my blog’s fan page. But, due to this, many of the newbies and my blogging buddies who kept on asking queries are now not able to connect me in a better way. However, I mentioned in my FB status update that they can contact me via email. Still, I thought to get some other way to connect well and help everyone, and there came the idea of starting out a Forum. Yes, it came to my mind as it is the thing that is already close to my heart and I always wanted it. Also, at times many newbies and others come to me with the same issue, and when they ask me, I have to explain the same thing to all of them again and again which really is a time killer stuff. But, I love helping, so I always tried to solve queries. But, as you know when you start blogging for full time leaving your day job, you have pressure to make money, and grow your business as well. So, taking out that much time was little tough. This problem also triggered me to start the forum so that when I give a response to someone for a particular problem that will stay on the forum thread. And, next time when someone comes to me with the exactly same problem, I can just send him/her the link of that thread. My time will be saved, and they get help as well. Also, not only me but many of other users and experts will reply to queries that will surely be going to help people in the much better way. Thus, with these thoughts, I started 24x7forum.com on 23rd July 2016. I would request you all to join the forum, and start participating by asking your questions and giving responses to the queries which solution you know. This way everyone will get benefits. If you have something to inquire about WordPress, Blogging, SEO, Domains, Hosting, etc., then you must join, and start asking in the forum. Ever since I started, Swadhin Agarwal and Gopi Kanna are helping a lot by sending their responses to the queries asked in the forum. I am not sure whether it is going to be a big forum in near future, but one thing is sure that I will try my level best to solve any queries asked in the forum. This initiative of forum is really cool! I am sure it will be the best platform to make some good discussions and get the queries solved. Also I am glad that you mentioned me here! Thanks for it! Hope to get your queries(if any) there as well. And, you can also reply on others’ post if you know the solution. Thanks for all your words. Hope to get you on board soon. Thanks for the invite, I am glad that I joined in. Thanks Atish for this initiative. 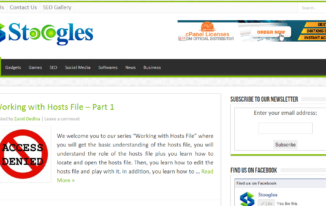 No doubt this will be a great help to many in the field of blogging. I am happy that you liked the idea. Hope to see you active there as well, Philip. I now many have questions and need answers . and helping and working together is always good. I am glad you have so many queries. What are you waiting for? Ask your questions, and you will be getting the answers. We will try our best to reply with solutions. Congratulations on your latest venture, I hope your latest venture will be successful. I have to know you since 2009 I think, we had started at the same time and since then you have been helping many many people. Now when I think, I feel honoured to have known you and to have been your friend. I will make sure to contribute to your forum. I am happy that I will be sharing the same knowledge with others that you had shared with me. All the best and I pray to the Almighty the you get all the success you want. Thanks, Imran. Glad to have you there. Let us make the forum a good place to avail help to everybody. What a wonderful way to connect with people rather than that long scroll down on Facebook. Of course I signed up to be part of this amazing forum. I am sure it will be growing quickly. As much as I love Facebook, I use my Page more often than anything. I just check to see if someone wants to contact me and that’s it. I will share blog posts I read on Facebook because so many people I know get value from it. But this is more on point! I am so excited you have set this up. I agree to this but I don’t why but Facebook was really killing my time. That is why I started my own discussion forum so that I can be busy in some productive stuff rather than keep on scrolling FB, and checking out photos, Gifs, and videos.. Ha ha ha. Thanks for joining in, Donna. Happ to see you there. 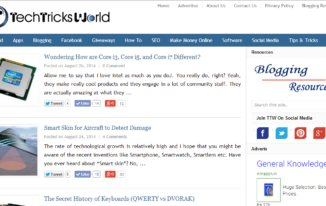 Enstine Muki recently posted…3 Foolproof Ways Bloggers Gain Leverage! Yes, great to have you there. Atish! 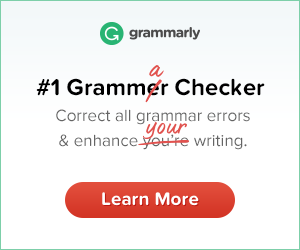 I almost cannot recognize as you’ve change your gravatar image. It much more handsome, but I love the previous one, honestly. Congrats for your new creating of your forum community. I’ve register the forum, but now waiting for activate email. Sure, I’ll be your active members. Hehe. change is the rule of nature so changed my gravatar after 3 years. Thanks for joining the forum. I have now activated your account. You can login and enjoy replying to queries of your interest. Nice forum. I would love to join it.